As they do annually before Christmas, fire fighters with the Menlo Park Fire Protection District reverse their role, igniting rather than extinguishing fires. The event attracts press from all over the Bay Area to watch stuff go up in smoke and interview Fire Chief Harold Schapelhouman [seen with KGO news above]. Twenty years ago, the District formed a partnership with Exponent, a company with an office in Menlo Park that analyzes failures and accidents to determine their causes and to understand how to prevent them. The District has worked with Exponent’s thermal sciences practice to better understand fire growth behavior in modern structures and has used this understanding to update their firefighting techniques in the hopes of reducing civilian and firefighter injuries and fatalities. 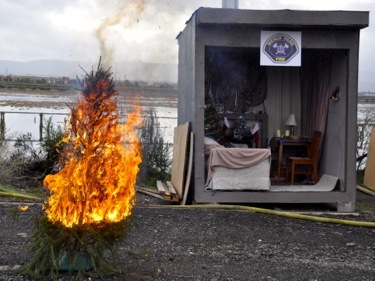 Together they conducted their annual holiday fire safety demonstration yesterday at the Baylands Structural Collapse Training Site at the base of the Dumbarten Bridge in Menlo Park. 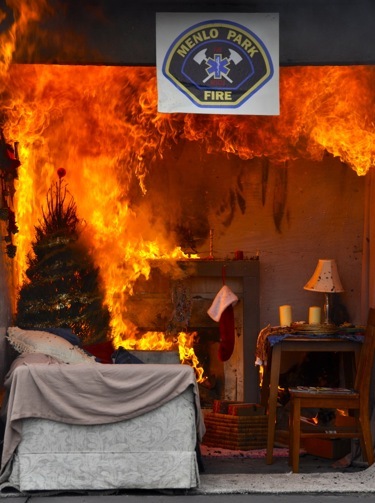 The live fire simulations demonstrated the dangers of an over-dry Christmas tree, seasonal candle use, radiant heaters, fireplaces without screens, and turkey fat fryers as well as carbon monoxide poisoning due to faulty appliances. Schapelhouman reminded the assembled press that in the last decade, Menlo Park firefighters have responded to several tragic fatality fires on both Christmas Eve and morning. In 2003, an early morning fire took the lives of two children in East Palo Alto when their Christmas tree ignited due to a fireplace that did not have a fire screen, and in 2005, an Atherton man was killed when he returned from a family get together on Christmas Eve as he was attempting to light his pellet stove and caught his clothing on fire. In 2009, eight people were almost killed when the build-up of carbon monoxide within their home in the North Fairoaks area incapacitated most of them; fortunately, Menlo firefighters arrived before it was too late. In one demonstration, candles placed too close to curtains caused the fabric to ignite. The fabric burned for over five minutes — enough time for a resident with a fire extinguisher to put it out. Left alone, gases build up causing a flash over [at about 860 degrees F.] in which the entire room bursts into flames.